Here’s another reason to be jolly this Christmas. The most popular shopping event of the country continues as Crocs sets another opportunity for Crocs fans to shop until they drop. 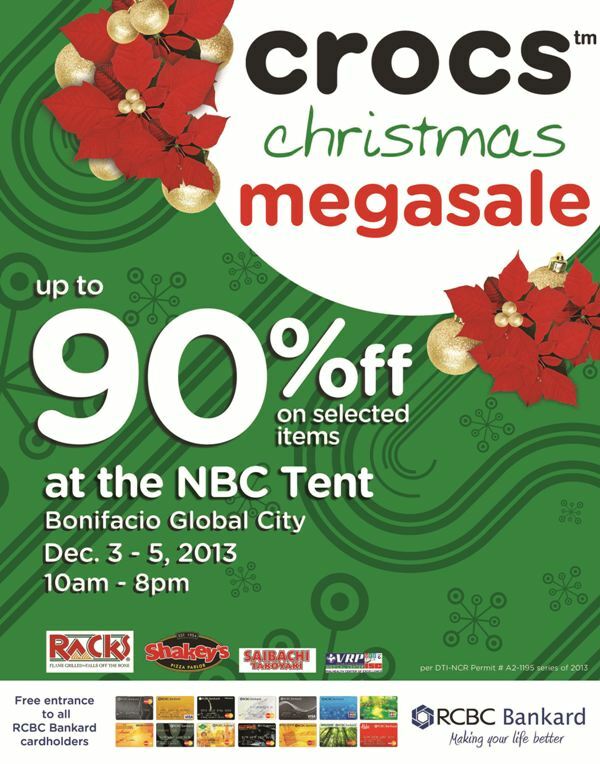 Fresh from the success of their Megasale in Tiendesitas last November, Crocs announces a second date at its homebase, the NBC Tent at the Fort from December 3 to 5, 2013. In what could be the biggest sale event of the year, Crocs says that the Megasale is a way to say thank you to their fans who have made the Megasale a success for five years running. As an added treat, RCBC Cardholders are treated to a free entrance for them and their companion of choice, while fans can enjoy all the choices for only a P50.00 entrance fee. With over 200 designs to choose form and at up to 90% off, the holidays are just more fun with Crocs.